In a nation of beer drinkers, it's amazing that so few people really know how to serve beer properly. 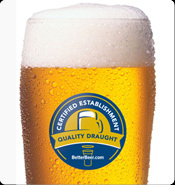 BartenderOne provides the ultimate in Craft Beer training with the Beer 101 Workshop. In one convenient 3 hour session, you will learn the differences between and taste Lagers, Ales, Stouts and Pilsners, learn the differences between them and which foods they go well with so you can give your guests the best service!